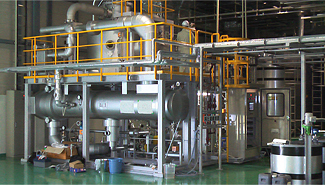 FFC Concentrator | KATSURAGI INDUSTORY CO.,LTD.- Dryers,Drum Flakers,Concentrators,Crystllizers. 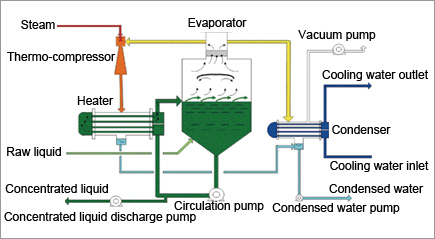 Evaporator itself is of a simple structure with only a vessel. Fluid circulated by the circulation pump is heated with the outside heater, and when it enters the evaporator, it is subjected to flash evaporation. Generally circulation liquid is fed to cause swirling flow. This is suited for the liquids, which become slurry or medium-viscous as a result of precipitation of crystals.